Jimmy Wireless Car Flush Gun Wash your car anytime, anywhere. Power Cleaner Garden Washer With a 21W fast charge, it only takes 2.5 hours to fill. 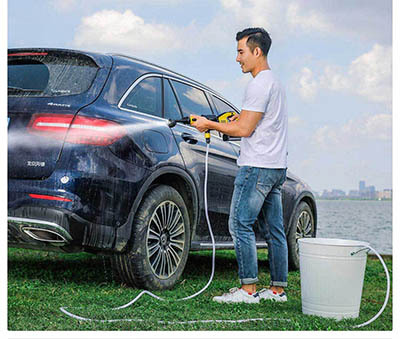 High-Pressure Handheld Wireless Car Washer Gun with Multi-function nozzle, satisfying 5 cleaning modes and satisfying various plot scenes. 2.Flush the car anytime, anywhere. 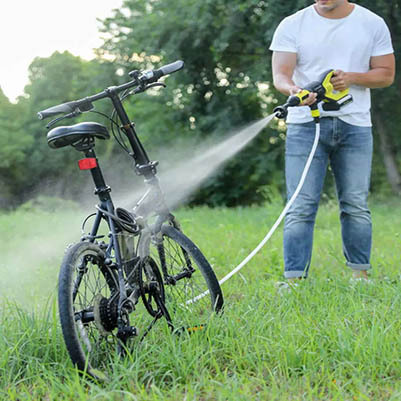 The multi-function nozzle has a total of 5 modes, which can be freely selected according to the use scene: 0 degree mode to accurately wash the tent, 15 degree mode to wash the grill, 25 degree mode to rinse the bicycle, 40 degree mode to water the garden, and shower mode to bathe the pet. In view of the shortcomings of the traditional cleaning machine, Jimmy's engineers have been painstakingly researching and developing, and will continue to be more functional and smaller in size, such as in a handheld mainframe. Colleagues use five 2500mAh power lithium batteries to power. Please contact the power cord. The 1800's lightweight body makes it easy to store and flush your car anytime, anywhere. The traditional washing machine only supports the faucet water supply, and the jimmy water gun supports both the faucet water supply and the self-absorption mode. Traveling in the wild, just put the water pipe into the creek, bucket or any water source, and the passengers start to rinse your car. The water gun contains the impurity filter and can be washed without worrying about the water quality. Step 1: Use a steplessly adjusted long shot to wash away stubborn stains. In order to make the water drops can be sprayed farther, our engineers designed long shots. With it, it is unstoppable to wash away from a distance. The long shot is directly sprayed into the fan-shaped stepless adjustment, the wheel is precise and direct spray, reducing waste, and the door fan-shaped flushing efficiency is higher. Using advanced foam generation technology, the detergent transforms into a large amount of fine foam at the moment of passing the high pressure water stream. And it is not restricted by detergents, it does not hurt the car wash liquid of car paint, and the dissolved powder can foam quickly. Foam volume adjustment function, the whole vehicle washing can quickly cover large flow, and partially wash small areas with precise wrapping to reduce waste. Professional car detergent recommendations: 1:100 concentrate, different detergent brands are different. Use the fan mode to flush the body foam, large area and large flow. The atomized water droplets sprayed on the body, wrapped in the washing foam, flowed quickly, and the car was completely renewed. The 180W powerful motor drives a high-performance water pump, which quickly inhales and pressurizes water and then ejects it along the barrel. The high water pressure of 2.2Mpa is equivalent to 8-10 times the tap water pressure and 180L/h large flow. High-performance lithium battery bid farewell to drag line troubles. The ECO mode lasts for 45 minutes, and the high-end mode lasts for 15 minutes. It can clean two cars in a row. With a 21W fast charger, it only takes 2.5 hours to fully charge. The battery pack can be disassembled for easy charging and replacement. When bathing a pet, it is recommended that you use the Eco+ shower mode to give your pet a more comfortable experience. When cleaning the screens, it is recommended to use the Eco+ fan mode to avoid too much water pressure and damage the screen window.